American expats living and working abroad expand their investment choices outside of US stocks and US mutual funds. Most of the time US expats have a foreign pension account or they own directly foreign stocks. It is absolutely legal to own overseas investments. The issue that many US expats face is that some of these holdings might be PFICs. What is PFIC? PFICs stands for Passive Foreign Investment Company. The complexity of preparing US expatriate tax returns increases remarkably if a taxpayer owns PFICs. Passive Foreign Investment Company or PFICs is a foreign corporation that meets the “income test” or the “asset test”. Income test. 75% of foreign corporation gross income is a passive income. Asset test. 50% or more of assets held by a foreign corporation generate a passive income. Passive income includes dividends, interest, gains from the disposition of stocks and securities, and gains from commodities trading. As a result of it, most foreign mutual funds are PFICs. Receive direct or indirect distributions from a PFICs. Recognize gains on a direct or indirect sale of PFICs. Make an election on Part II in regards to their PFICs holdings. 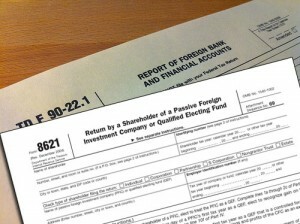 Passive Foreign Investment Companies rules go back to 1986 when they were originally passed as a part of the Tax Reform Act of 1986. The PFICs rules were introduced to eliminate a tax advantage for investors in passive assets overseas. If the IRS decides to implement the PFICs ruling in a tax year 2013 or later, US expats will be required to file form 8621 for prior years per IRS Notice 2011-55. FATCA is changing the tax systems across the globe. The IRS will have an access to the foreign financial accounts of US persons when FATCA will officially come into effect on January 1, 2014. Since PFIC holdings will be reported as a part of FATCA, US expats are advised to determine whether they have to report PFICs. US citizens and green card holders should contact a CPA that provides US expat tax services for U.S. citizens and green card holders.